While these vehicle manufacturers are making adjustments to help combat road side key cloning theft, unfortunately the thieves are continuing to be one step ahead. This is where the unique Trackstar Advance tracking systems comes into place. The Trackstar Advance car tracking system has been designed by Trackstar to combat the issue of Key Cloning for BMW, Jaguar and Land Rover. As a result the device is approved by the vehicle manufacturers and also now recognised by many top insurance companies. A unique driver ID card kept on the vehicles key ring deactivates the onboard immobiliser built into the Trackstar Advance unit, this allows an authorised driver use of the BMW, Jaguar or Range Rover. However should your key be cloned, this cloned key can only be used to open the vehicles doors. 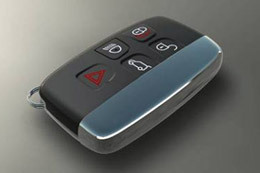 The onboard immobiliser of the Trackstar Advance Tracking System will prevent the cloned key from starting the vehicle. Should the thief attempt to tamper with the Trackstar Advance system fitted to your BMW, Range Rover or Jaguar then a silent alert is sent to the 24 hour monitoring centre at Trackstar headquarters who in turn will contact you to verify the safety of your vehicle. You can watch the BBC Watchdog report on BMW Key cloning below, we're sure you will agree it makes for disturbing viewing. For more information on BMW, Jaguar and Ranger Rover Key Cloning prevention please contact us where we will be happy to discuss the great benefits of this system with you. We provide a mobile installation service to towns and cities in Yorkshire including: Wakefield, Pontefract, Castleford, Dewsbury, Leeds, Huddersfield, Bradford, Sheffield, York, Hull, Goole at a location to suit you. ✓ Combat the issue of KEY CLONING on BMW, Jaguar and Range Rover. ✓ Prevents Theft even with the vehicles keys. ✓ Combats Key Cloning by use of computer and Key Theft. ✓ Uses Automatic Driver Recognition Cards to prevent the engine from starting.